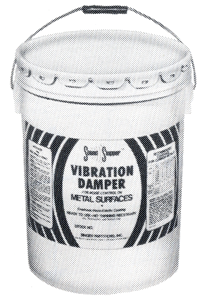 Vibrating surfaces are often dampened by applying visco-elastic materials directly to the surface, thus converting the vibration energy to heat. The flexing of the damping material provides the energy dissipation and “decay” to reduce noise. Metal no longer “rings” when it is struck or excited by airborne noise. Light beige, non-reflective stipple finish. 85.3 lb./cu. ft (wet), 72.9 lb./cu. ft. (dry), 350 pentrometer viscosity at 80°F. Sprayable loose paste. All components have FDA approval. Vermin resistant. Resists dilute acids, alkalies, grease, gasoline, aliphatic oils. Dried coating will soften with prolonged soaking in water, but will recover after subsequent drying. Material Safety Data Sheet (OSHA) available upon request. Useful range of 25° to 120°F; maximum service range of -20° to 120°F. Coating is non-ageing. WARNING: Wet material is an emulsion and therefore should be protected from freezing. Base material should be free of grease, oil, dirt, scale and moisture. Wire Brushing is recommended. Adhesion is greatly improved on unfinished metal surfaces if zinc chromate or red oxide primer is applied first. Maximum application thickness per layer: 9/64” wet, which dries hard in 24 hrs. @ 77°F. A 1/32” layer dries hard in 4 hrs. @ 77°F, or can be dried in 5 min. at 220°F. Effectiveness: Recommended coverage will result in damping ratio of at least 50 dB per second at 60°F. Specific performance may be affected by geometric configurations and, therefore, should be determined empirically.